One day as Mayra Gutierrez was bathing her 11-month-old daughter, Montserrat, she noticed a little bump coming from her daughter's abdomen. "I was giving her a massage on her tummy and that is how I felt a bump," said Mayra. "At first I thought it was a hernia. We took her to her pediatrician. The doctors did studies and she was diagnosed with Wilms' tumor." According to the American Cancer Society, Wilms’ tumor is the most common type of kidney cancer found in children. 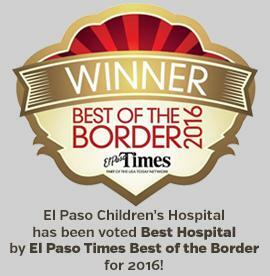 Montserrat was brought to El Paso Children’s Hospital where Pediatric Oncologist Dr. Erika Lopez Bertiery, began her protocol. "She is a magnificent doctor," states Mayra. "We are receiving the best services. She is very kind with her patients." 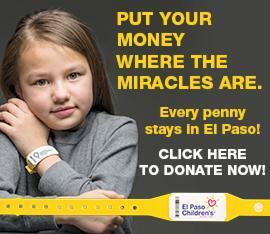 Montserrat underwent surgery at El Paso Children's to remove the tumor. After five months of chemotherapy, she is in the final stage of her treatment. There are so many sick kids just like Montserrat who need specialized treatment at El Paso Children's Hospital; the only place in our City that offers the latest research and protocols for children with cancer. "Please help," invites Mayra. "There are many kids here that are in treatment and need your help. We have great services here; great doctors and nurses who always treat us very good. And everything is for the health of our kids."